It’s true. Every language is either a barrier or a connection between you and another person. If you are unable to get your message across to the other person or entity, then it is a barrier. In business, this can cost hundreds, thousands and even millions of dollars. If you and the other person or entity are able to communicate and comprehend each others’ points, it then becomes a connection. This relationship can grow and the bond can be quite strong and powerful, but that only happens when the message is clear and concise. We can make sure that your message isn’t lost in translation, but clarified and exemplified without any degradation. Our services range from simple document translations to specialist translations, multilingual research and website translations. 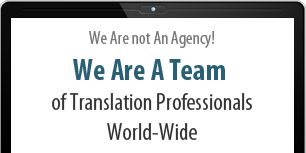 With our growing network of over 500 qualified and experienced translators, proofreaders and researchers, we are able to provide you with quick and accurate results for all your translation needs.